Following its first reading, a bill will have its second reading, within the next fortnight for a government bill or for a private members' bill on one of the first available Fridays if time permits. This provides the first main occasion for debate on the general principles of a bill - detailed discussion being reserved for the committee stage. On second reading the bill is normally proposed by a government minister (often the senior minister) in the department responsible for the measure. He or she outlines the main principles of the bill and summarises the most important clauses. The official Opposition spokesman then responds and during the debate the views of other opposition parties and backbenchers are heard. The debate normally concludes with a response from another government minister and he or she deals with some of the major points raised in the debate. Unless the bill is non-controversial the Opposition in the Commons will usually decide to vote against a government bill on its second reading, or to move an amendment to the motion 'that the bill be read a second time'. If the House votes against the bill at second reading, the bill can progress no further, but this virtually never happens. Public bills relating exclusively to Scotland or Wales have been referred by the House of Commons, in certain circumstances, to the Scottish or Welsh Grand Committee. When this happens, the second reading committee must report that it has considered the principle of the bill. The Bill thus returned to the House has not been read a second time, but subsequently a formal motion to give it a second reading is considered without debate. UK Parliament bills relating exclusively to Scotland are rare since the establishment of the Scottish Parliament. As in the Commons, following its first reading, a government bill will have its second reading within the next fortnight. The debate is opened, and may also be closed, by the senior government spokesperson in the Lords for the government department responsible for the bill. There is a convention (known as the 'Salisbury' convention) that the Government's manifesto commitments, in the form of Government Bills, are not opposed by the House of Lords at second reading, but reasoned amendments may be tabled as a means of indicating dissent and can be voted on. 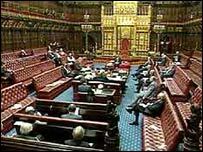 Unlike the Commons, the House of Lords does not allocate certain days for private members' bills; time is normally made available for them as necessary.